For the first time Alrosa, the state-owned diamond miner, has come out in public and said it wants to buy Grib, the only commercially developed Russian diamond mine owned by LUKoil and its chief executive, Vagit Alekperov. Why it should say so now, when earlier announcements by Alrosa have veiled the target and concealed sale and purchase talks with LUKoil a year ago, isn’t clear. “If the asset proves to be interesting,” said Igor Kulichik, Alrosa’s chief financial officer, “and if we agree on the price then we are prepared to discuss with Lukoil the purchase of this asset.” Kulichik was briefing sector analysts on Alrosa’s third-quarter financial results on December 5. He was explicitly asked about the Grib sale by a VTB analyst. “We know this asset quite well and we follow it. Yes, Lukoil is targeting to commence production and beneficiation early next year and in the next year they are targeting to already sell from there. We discussed with Lukoil a potential sale of that pipe about a year ago. But our geologists find it difficult to assess exactly what raw material is there in that pipe. So we decided not to rush, basically to let Lukoil start production there, see what comes out of that pipe, see how it develops and then to consider the potential purchase of the asset.” Kulichik made his comment on December 5; Alrosa published the transcript five days later. Kulichik was being disingenuous when he claimed last week that “our geologists find it difficult to assess exactly what raw material is there in that [Grib] pipe.” The data prepared first by De Beers, then by LUKoil, and confirmed by Rio Tinto, have indicated the new Grib mine holds mineable reserves of at least 98 million carats; that is roughly twice the volume of mineable diamonds compared to Alrosa’s Lomonosov mine next door.. Only one Alrosa mine, Aikhal in Sakha, has a mineable diamond reserve to compare with Grib, at least according to this expert analysis on which Alrosa’s long-term production plan is based. For details of the older reports by De Beers, which once owned Grib through Archangel Diamond Corporation, read here. For Alrosa to enlarge its reserve base from 607 million carats to 1.2 billion carats, the Alrosa geologists are already counting on Grib. Presentations by the LUKoil management at Grib led by Maxim Mescheryakov indicate that more than $500 million has been spent to date on the new mine. 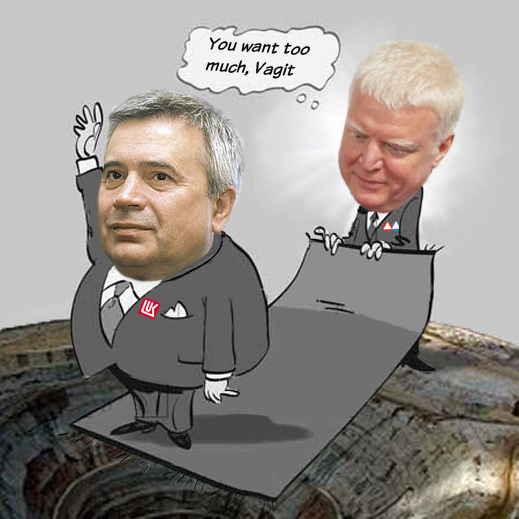 At an average grade of 1 carat per tonne of ore, and at the three-year old price of $100 per carat, LUKoil is expecting to recover the cost of the mine in seven years. But given the rise in diamond prices to date, annual sale revenues by 2015 could be more than $650 million, and the payback period cut in half. By volume of mine output, Grib trails behind the biggest of the Sakha region mines of Alrosa, which peaked at over 13 million carats per annum several years back. Today, the largest of Alrosa’s open-pit mines, Nyurbinskaya and Jubilee, are producing, respectively, 7.3 and 6.3 million carats per annum (2012). Grib will produce 2 million carats in 2014, and reach capacity the year after of between 4 and 4.5 million. Thirty kilometres away from Grib, Alrosa subsidiary Severalmaz is building its Lomonosov mine which is planned to produce about 2 million carats next year. Alrosa reports spending Rb120 billion ($390 million) on building this mine since 2010. According to LUKoil, its plan for ceremonial commissioning of the mine, with President Vladimir Putin presiding, has been postponed from November to a date after the Sochi Olympics, which conclude at the end of February. Production at the mine will start this month. Goryainov says he does not expect that Alrosa would fight LUKoil at the Kremlin to gain control over the new mine. Nor does he anticipate that LUKoil would lack the administrative resources to resist if Alrosa tries.